Dyan Garris’ soul-soothing New Age CD series: These New Age CDs are part of Dyan’s Spiritual Toolbox™ and are meant to help bring the positive effects of music, guided meditation, self-healing, Automatic Chakra Balance™ and multi-dimensional vibrational attunement to all by merely following one simple instruction: Just listen. These are “New Age” CDs that help you integrate your mind, body, and spirit. And that integration is what forms the foundation for all of manifesting. Comprised of multi-layered, angelic, instrumental New Age music, in a neo-classical style, each CD is meant to build on each other as the listener progresses from one to another. Although it is not necessary to listen to each in a linear order, they offer the maximum healing effect when used in progression. The first six Dyan Garris New Age CDs (A Healing Journey, Moment by Moment, Reflection, Patterns, Illusions, & Connections), have a guided meditation at the end as the last track, each for a particular purpose. Release and Eight: Music for Ascension are all music and no guided meditation. There are 4 compilation CDs each in 2 volumes: Perfect Pathways Vol. 1 & 2 (meditation only compilation), and Spiritus Sanctus Vol. 1 & 2 (music only compilation). 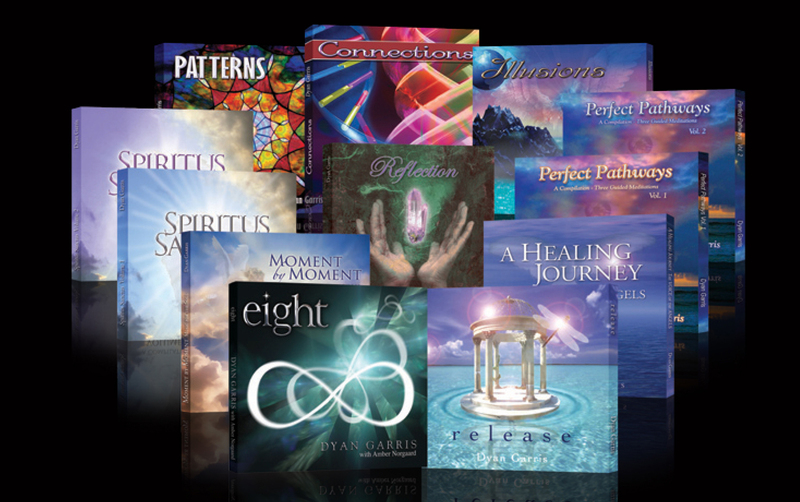 The New Age CD series by Dyan Garris is multiple award nominated and has earned the National Health & Wellness Stamp of Approval. Buy or download Dyan Garris CDs on CD Baby, Amazon.com, Voice of the Angels.com and many other online music sites.